Karthick, B., Hamilton, P.B. 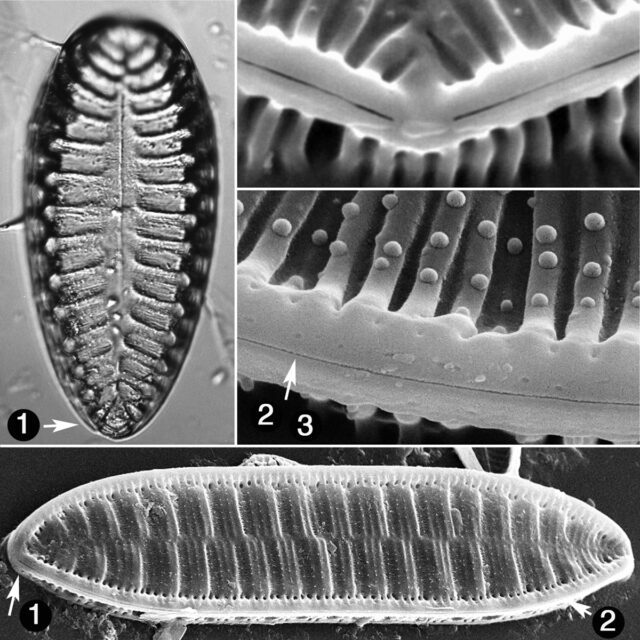 and Kociolek, J.P. (2012) Taxonomy and biogeography of some Surirella Turpin (Bacillariophyceae) taxa from Peninsular India Nova Hedwigia, Beiheft 141: 81–116. Pickett-Heaps, J.D., Cohn, S., Schmid, A.M.M., and Tippit, D.H. (1988) Valve morphogenesis in Surirella (Bacillariophyceae). Journal of Phycology 24: 35-49. Pickett-Heaps, J.D., Schmid, A.M.M and Edgar, L.A. (1990) The cell biology of diatom valve formation. In: F.E. Round and D.J. Chapman, editors. Progress in Phycological Research, Bristol. Biopress Ltd. pp. 1–168. Van de Vijver, B., Cocquyt, C., de Haan, M., Kopalová, K. and Zidarova, R. (2012) The genus Surirella (Bacillariophyta) in the sub-Antarctic and maritime Antarctic region Diatom Research 28: 92-108.